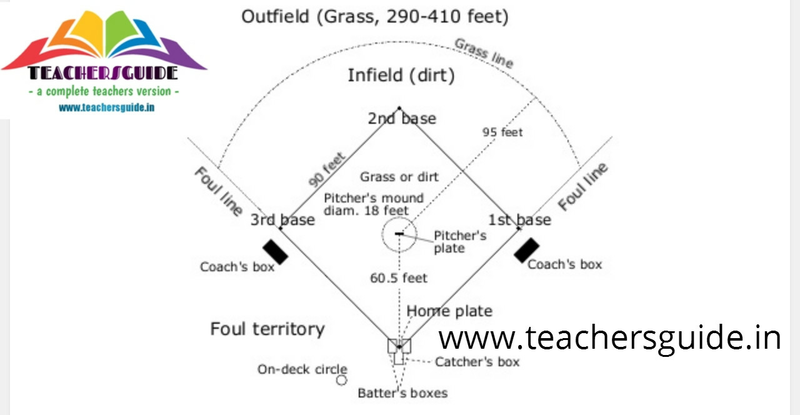 Dimension of baseball diamond - infield is 90 feet square, outfield is space between two foul lines. Distance of outfield (grass line) - 95 foot from pitcher's mound. Size of home plate - 17×17 inch plate at center of 26 foot diameter home plate area. Distance of foul lines - foul lines (poles) should be minimum 325 feet from home plate. Dimension of bases - 90 feet apart, 15 inch square, 13 foot surrounding arcs. Dimension of batter's box - 4 × 6 foot, 6 inches from home plate. Pitcher's Mound - 24 × 6 inch pitching rubber lies at center of diamond. Diameter of Pitcher's mound - 18 feet, mound is 60 feet, 6 inches away from home plate. Size of baseball bat - it is not fixed and depends on weight and height of batter, av. size varies from 28" to 32". Diameter of barrel of bat - maximum 2-5/8"
Material of bat - alumunium alloys, composite materials like graphite fiber. Size of baseball infield glove - 11.25 inches to 12 inches. Size of ball in baseball - 2-7/8" to 3" diameter, 9 to 9-1/4" circumference.